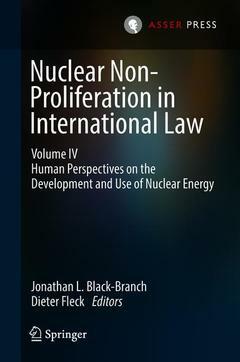 This fourth volume in the book series on Nuclear Non-Proliferation in International Law focuses on the human perspectives regarding the development and use of nuclear energy; the need for regional solutions; and recent activities towards prohibiting and abolishing nuclear weapons. Jonathan L. Black-Branch is Dean of Law and Professor of International and Comparative Law; Bencher of the Law Society of Manitoba; JP and Barrister (England & Wales); Barrister & Solicitor (Manitoba); and, Chair of the International Law Association (ILA) Committee on Nuclear Weapons, Non-Proliferation & Contemporary International Law. The Significance of the Human Impact for Nuclear Safety and Nuclear Disarmament.- Part I :Regulating Nuclear Applications.- A Social License for Nuclear Technologies.- Nuclear Materials for Human Health and Development.- ‘We Have To Give Up Business As Usual’: Anti-Nuclear Protests and the Construction of a Defence of ‘Legitimate Civil Resistance’.- A Gender Perspective on Nuclear Weapons and Human Rights.- Liability to Responders to a Nuclear Accident: Where Should The Law Go?.- Human Rights, Disability, Economics and Nuclear Releases.- Part II:Striving for Regional Solutions.- African Perspectives on Denuclearisation and the Use of Nuclear Energy for Peaceful Purposes.- The African NWFZ, The African Commission on Nuclear Energy, and the Protection of the Environment.- If the Government Errs, Corporate Losses are Their Own to Bear: Corporate Best Practices for Indigenous Engagement in the Uranium Industry.- Uranium Mining: Environmental and Human Health Effects.- Nuclear Law, Oversight and Regulation: Seeking Public Dialogue and Democratic Transparency in Canada.- The ‘Inalienable Right’ to Nuclear Energy under the Nuclear Non-Proliferation Treaty: Indigenous Rights of Consultation, Self-Determination and Environmental Protection of Aboriginal Lands.- Part III: Prohibiting Nuclear Weapons.- Is Deterrence Morally and Legally Permissible or Is It a Form of State Terrorism?.- The Treaty on the Prohibition of Nuclear Weapons: A Further Confirmation of the Human- and Victim-Centred Trend in ArmsControl Law.- Why was Canada Not in the Room for the Nuclear Ban Treaty?.- Is the Treaty on the Prohibition of Nuclear Weapons Accessible to Umbrella States?.- The Treaty on the Prohibition of Nuclear Weapons: Challenges for International Law and Security.